Mothers’ views about whether and how much they would like to work have changed significantly in the recent years. Compared with 2007, more mothers now say working full time is ideal for them, and significantly fewer say not working at all would be ideal. However, this change may be more a reaction to outside forces than a natural evolution of views. Between 1997 and 2007, the share of mothers with children younger than 18 — both those who are working and those who are not — who said their ideal situation was to work full time fell significantly. 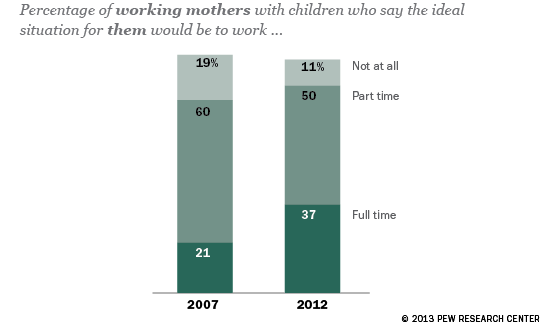 But between 2007 and 2012, mothers’ views about full-time work moved in the opposite direction. The share saying that full-time work would be ideal for them rose sharply, from 20% to 32%, while the share saying they would prefer not to work at all fell from 29% to 20%. There was no clear explanation for the change in attitudes from 1997 to 2007, but the more recent shift occurred during one of the most difficult economic periods in recent history. The Great Recession, which officially started in December 2007 and ended in June 2009, had an impact on mothers and fathers alike. The recent shift toward a preference for full-time work has been more pronounced among working mothers themselves than among those who are not employed. Fully 37% of today’s working mothers say their ideal situation would be to work full time, up from 21% of working mothers in 2007.